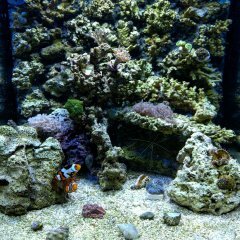 to the best of my knowledge no general (saltwater) aquarium book is on the market. I am not talking a 'how to set up your tank' or fish/coral ID book, but a book with beautiful photos for inspiration and background on biology, technology, different types of aquariums (NPS, pico, coldwater etc), aquaculture vs wild caught, history, the aquarium 'scene' etc etc. On one hand I think there is a huge market for such a book (as it is such a big hobby), on the other hand internet forums and social media have a lot of info and people might not be in to books much anymore? Any thoughts, would you be interested in such a book? I might write it! Sometimes it's hard to get a lot of feed back on a forum. Writing a book is a big undertaking, and the rewards might not be as great as you'd hope. But if this your passion and you're offering something unique, then go for it. It's an aquarium book, that turns into a pico tank stand. internet forums and social media have a lot of info and people might not be in to books much anymore? Certainly true for a segment of the population. In all honesty I would prefer the book and with today's technology could also be published as an ebook. One of the most fun parts of the hobby for me is aquascaping, I tend to see a lot of the same things repeated time and time again. While obviously some things work and are worth repeating there are only so many "island scapes" that I can build before I start thinking of "floating reefs", "avatar scapes" and other out there themes. I'd want more of these in the book. I mean @ChristopherDidohas set up an amazing theme in the pico contest, check that out if you'd like. @Ratvan thanks for the compliment, really hoping I can pull it off! I'm honestly not sure what I think of something like a book for the purpose you seem to be thinking. I only say this because as of right now, as said above, there is not a lot of agreement on things and the hobby is changing so fast right now as technology expands. I've only been in the hobby a little over two years and I've already seen practices change. In any event if you're really passionate about the idea go for it! Good luck!